New Prairie Dogs at the Zoo! 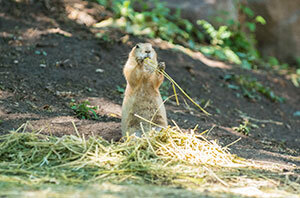 The Milwaukee County Zoo is pleased to welcome four new prairie dogs to its North American animal collection! The new members come to us from a breeding program at the Scoville Zoo in Illinois, and all four are male and between 1 to 4 years old. For several weeks after arriving, our prairie dogs spent nearly all of their time underground working on their elaborate tunnel system. Just like people have kitchens, bedrooms, and bathrooms in their homes, prairie dogs have distinct chambers within their burrow system for storing food, nursing their young, sleeping, and relieving waste. Our prairie dogs’ diet consists mostly of alfalfa, leaves, and rodent feed, but enrichment foods provided to them by zookeepers include different vegetables and fruits—they seem to be especially fond of apple treats! They are fed a portion of their food in puzzle feeders that they have to work at to reach the food, and new logs and tree stumps are rotated through the exhibit for them to explore. The Zoo’s prairie dogs are black-tailed, one of five species of prairie dogs. Although not threatened to the level of some of the other species, the historic range of black-tailed prairie dogs has significantly declined due to human expansion and eradication efforts by ranchers. Many populations now exist only in protected areas, but prairie dogs fulfill an important role in their ecosystem. They are prey to numerous animal species—the endangered black-footed ferret in particular relies upon them for survival—and they also modify vegetation, aerate the soil, and their extensive burrows provide shelter for many other small animals. Prairie dogs have highly complex social communities and utilize a range of sounds to “call” to one another to warn of nearby dangers. Stop by the outdoor Prairie Dog Exhibit—located next to the Elk Yard—and see if you can spot a prairie dog keeping watch for predators!